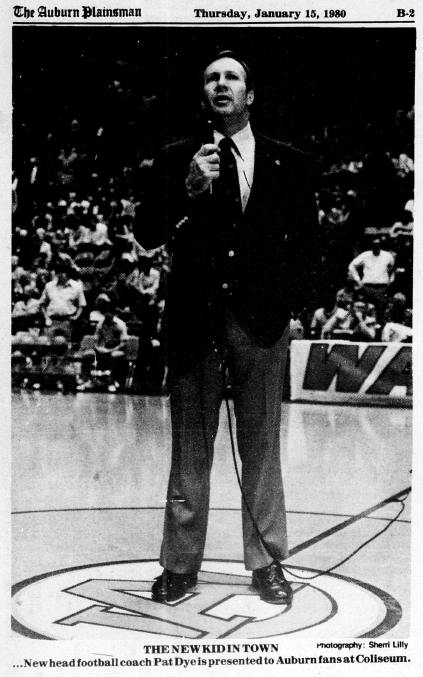 Pat Dye was introduced to Auburn fans on Jan. 10, 1981, at the Auburn-Florida basketball game in Beard-Eaves Memorial Coliseum. We have an eight-second clip of it. The video is silent, but the place was loud. Dye got a standing ovation. He said that encouraged him. Three years later, Auburn won the national championship. Here’s a great picture of his family taken a few months later. Related: Pat Dye claimed the national title for Auburn in 1983, said his team would wear New York Times national championship rings.